Home Tarot Reading for Everyone! A client drew this spread yesterday, and I started laughing – not at the client, but at the cards. 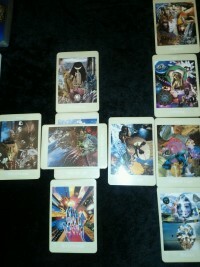 It’s almost a universal reading for everyone on the planet, so I decided to post it with my interpretations. Feel free to give your (polite) alternative readings for the cards. Staying on the surface, not willing to dive in and experience all that is available. Even though you have a safety line to the board, it’s still hard to get off and go deep. Forgetting Everything’s All Right -or- False Evidence Appearing Real. The card stands for all those programs that got installed when you were a child, and they keep you from going out and doing what your heart desires. Safety line, remember? You’ve walked an interesting path, so now you can share it. The answer to the question “Am I on the Right Path?” is always and forever YES. You cannot be on the wrong path; it’s impossible. Everything that happens in your life allows you experience to share with others. Unfortunately, human beings tend to only learn from pain, so those tend to weight the lesson plan heavily. Needing to find your Source, looking for support while you’re travelling your Path. As you look around, you notice that you’re exactly in the right place. It’s like when you find out there’s one less step at the bottom of a staircase, and you stumble a bit, and then you’re OK. The “community” card represents attracting people into your orbit to join you. You’ve got something they want: will you let them in? Go forth and take charge of your world! Plant the seeds of your greatness! Take the gifts the Universe offers, and use them! Open up and let it in – no strings, only Love! … Take the gifts the Universe offers, and use them! Thank you, Lorraine! I thought it was such an important message to share, and needed to be said.